As the college football season winds down in the last remaining week of the regular season, there are plenty of amazing games left that will possess a significant impact on the CFP4 Playoff and my well designed mock simulation of an expanded field of 16. It seems fitting that with the last week remaining in the regualr season there are still four (4) 0-loss programs left standing. Only three (3) of which are part of the bifurcated CFP4 system, with Central Florida still looking as impressive and consistent, but not receiving the earned credibility it has earned over the past two (2) seasons. This coming weekend for college football is called “rivalry weekend”. The traditional games in which possess state and regional rights for the competing college football programs. All college football fans get excited about this coming weekend for college football because of what is at stake.These games have meaning, history, and high emotional impact. Who will survive and advance and keep their playoff hopes alive. As for my mock field of 16, I know that the four (4) 0-loss FBS programs have all secured berths and cannot be eliminated from the field of 16, based upon the professional model theory. That leaves twelve (12) open spots with six (6) 1-loss programs and nine (9) 2-loss programs battling for the remaining twelve (12) spots. It will be an exciting final week. Let’s see who remains standing after next weekend. For the past four weeks of my weekly college football rankings, the Top 4 have remained the same as a group and the Top 7 has remained the same group with one (1) position change between Ohio State and Oklahoma. I have also performed an analysis in comparing my Top 25 rankings versus the Top 25 rankings of the so called ranking “experts” based upon sustainability to keep their ranked position when comparing the subjective system to the professional model theory system. The early results have determined that my professional model theory system has a slight advantage in sustainabilty and success when compared to the subjective system. Below are my college football Week 7 CFBPOEXPERT rankings. The rankings are more accurate and data driven based upon multiple categorical variables which are quantifiable and qualitative. Please be aware that the grid might be off center within the blog post page. I have tried my best to make sure it fits to page for best viewing. 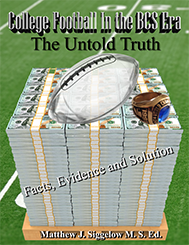 The statistics and data are collected and evaluated during every week of the college football season. Below is my new ranking system which is criterial based, in which I have collected for the past 5 FBS seasons, previous to this 2018 FBS season. This ranking criteria examines FBS Offensive Efficiency and Defensive Effectiveness. These categories are quantitative, qualitative and measurable with no subective basis. These are EARNED statistical data points and ranked positions which shows efficency and effectiveness. This is the first time I have ever posted these data points in relationship to FBS prorgams. This TOP 25 is ranked in order based upon offensive efficiency percentage rates and defensive data points. As we head into the final week of college football’s regular season, there are 71 FBS programs that are bowl eligible. In addition to the final week being rivalry week, there are twenty-three (23) (5-6) FBS programs still competing for bowl eligibility. Based upon my research, there are plenty of bowl eligible programs and bowl games to accomodate the support of an expanded 16 team playoff format for college football at the highest FBS level. We are down to the last furlong of this college football season. Who will survive the last week? Please forgive this is late. I was focusing on my first responders course for work and just could not get to posting and publishing my weekly rankings. I will provide the Week 6 CFB rankings, since I still collect the data and rank CFB programs even when I do get busy. Here are the week 6 Top 25 CFB football rankings for all of the FBS level.